Mahindra Stallio was launched by actor, producer and director, Aamir Khan, whose thought provoking movies have served to both entertain and inspire an entire generation of young Indians. The Mahindra Stallio is available in two variants – Self Start / Cast Alloy wheels / Digital Console and Kick Start / spoke wheels which are available at Rs.44,699/- and 41,199/- (ex showroom Pune), respectively. 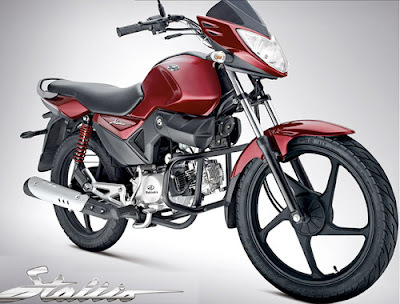 The Stallio will be available at 370 Mahindra 2 Wheelers dealerships across the country. The Stallio comes with a four year manufacturer’s warranty. Biking will soon take on a whole new dimension with this powerful steed. The Mahindra Stallio is a tough and durable bike with several stylish features which puts it in a distinct motorcycling segment. These include digital speedometer, powerful LED tail lamps, pilot LED lamps and a fully flush fuel tank cap. 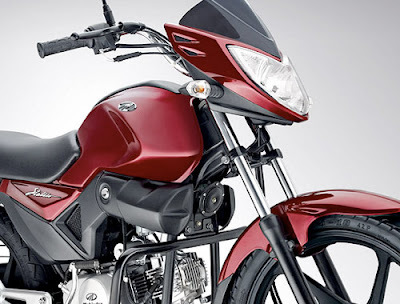 Mahindra Stallio is of 106.7 cc engine and it is one of the latest powerful machine from the plant of Mahindra two-wheeler. It is a 4-Stroke, Air cooled, SI engine, Single cylinder engine with a 4 gears constant mesh that offers maximum power of 7.7 PS at 7500 rpm. 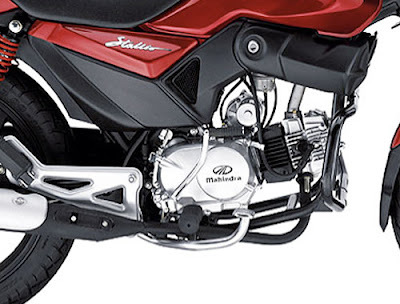 The new Mahindra Stallio produces high torque of 7.6 N-m at 6000 RPM. Mahindra Stallio incorporates a convenient, pro touch electric start which allows you to take off at the touch of a button, even in heavy traffic conditions. The multi reflector headlamp coupled with LED lighting with clear lens indicators in the headlamp, tail lamps and pilot lamps enhance front and rear visibility, making night riding a safe experience. These LED lights are more resistant to failures from vibration, generate almost no heat and consume very little power. The bike’s chassis features a rugged, double cradle frame, ensuring greater stability and less possibility of deformation in future. The superior braking system, more responsive controls that perform well in a variety of conditions, including water and mud, makes the Mahindra Stallio a very safe bike. 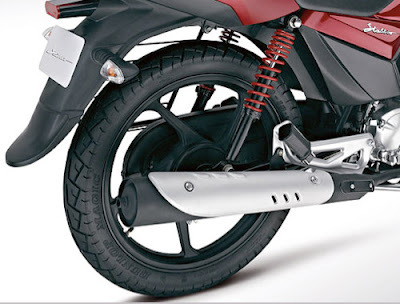 The sturdy rear grab rail offers the pillion rider a firm grip, ensuring safety. The large, fully digital display – the first in this segment - comes equipped with a speedometer, fuel gauge, tachometer and clock. It also gives you an idea of the distance travelled in one trip. The Stallio’s visor features a sharp, inverted arrow design which is sure to stop traffic when you zoom past. This nifty bike sports cool racing style alloy wheels which are strong and lightweight. They not only provide more stability at corners but also have better tolerance to shocks and ensure good heat dissipation. These trendy alloys are complemented by class leading wheel base of 1265 mm which provide a stable ride and good ground clearance. 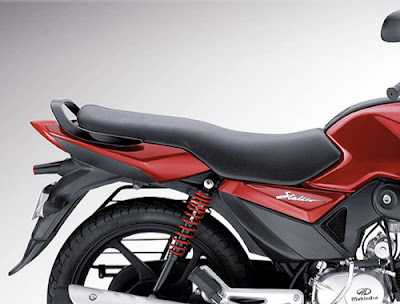 The fuel tank cap blends seamlessly with the body of the bike, further adding to its style quotient. The Stallio is available in a choice of five shades – Derby Red, Colt Black, Equus Blue, Buckskin Yellow and Ranch Green.